Yesterday, I read the sad news that cancer had returned to Roger Ebert, and I suspected that the headlines of today - that he has died, at just 70 - were not far off. He published his final entry in Roger Ebert's Journal for the Chicago Sun-Times just two days ago. "Thank you," it opened, as he thanked his readers for what they gave him over the years. I came to know Roger Ebert and his thumb-giving colleague Gene Siskel through the PBS show Sneak Previews, which was such an eye-opener to the teenage movie buff that I was in the late Seventies. I devoured magazine reviews of movies (anything I could find at home or at the library by Judith Crist or Richard Corliss and later Pauline Kael), but I loved watching Ebert and later reading his books and columns. He had popular tastes, but he had a wonderful way of shining a light on movies that needed the boost. No doubt many of the obituaries to be written in the next few hours will focus on the profound influence he had on independent and foreign titles, some being able to find distributors and audiences because of his words. That was one mighty thumb. Roger Ebert has endured a great deal through his very public health battles; losing much of his lower head to cancer meant the loss of his voice, but it didn't keep him quiet. He can speak again, thanks to technology. Check out this TED presentation. I wonder if anyone can read this piece by Roger Ebert and not feel their heart break. I was skimming through my feeds and noticed that there had not been much lately in terms of volume from Ebert, whose writing I've admired for about three decades. His Twitter feed is still very active, but this piece - titled Goodbye To All That, and published Feb. 9 - illuminates how difficult his life has become since cancer took away his ability to speak, much of his lower face (he has since been outfitted with a prosthesis, shown above) and, increasingly, his mobility. Ebert decided he could no longer take part in an annual event in Boulder, Colo., called the Conference on World Affairs. Ebert hosted a film-critiquing party that must have been a movie geek's dream. Saying farewell to Boulder forced me to acknowledge that I must abandon many rituals. I can no longer rise at dawn and trace out my usual steps around the Lincoln Park ponds and the Lily Pond. I can no longer sit in a coffee shop and read, unless I want to order a useless cup of coffee. I can no longer wander aimlessly around London. Because of the damage done to my shoulders during the surgeries, my wandering days are over. I can walk for a mile, maybe two, before the right shoulder starts to hurt too much. Ironically, it hurts more when I stand than when I move. Walking is now single-minded, and not a meander. I will certainly never take The Perfect London Walk again. I've been to my last Formica restaurant, one of those places where they serve breakfast 24 hours a day and the waitress calls you "honey." When I go to a restaurant now, Chaz makes sure they have a chair that goes easy on my back. I often find myself sitting at a lower level than the others, like a child at Christmas dinner. It is difficult or impossible to revisit most of my ritualistic stops. It is even impossible to routinely make the rounds of used book stores, because I can't stand for hours studying the shelves. Not being able to speak causes me no physical pain. Ironic, that surgery intended to restore my speech took away my freedom of casual walking. All is not entirely bleak. He continues: "I can still drive as well as ever, and last August bought a new car, probably my last. I have books, movies, newspapers, magazines, television. I write more than ever. The social media are more social for me than for most people." You can read the rest here. Again, it's heart-breaking. It's a shock to see a photograph of Roger Ebert in the new Esquire, which offers a revealing article on the world's best-known film critic, four years after surgery for cancer removed his jaw and his ability to speak (and eat, for that matter). Ebert is still writing regularly, though, and his Twitter feed is a favourite of mine. It's heartbreaking, though, to realize how much the man has endured. I studiously avoid looking at myself in a mirror. It would not be productive. If we think we have physical imperfections, obsessing about them is only destructive. Low self-esteem involves imagining the worst that other people can think about you. That means they're living upstairs in the rent-free room. This video is astonishing. It's of a woman named Kseniya Simonova, who won the Ukraine's Got Talent competition, using what's called sand animation. Incredible, and small wonder 12 million people have watched this video so far (I learned about it from Roger Ebert's blog). One. I've been listening to a podcast by CBC.ca writers Rachel Giese and Katrina Onstad about what they've been taking in at the Toronto International Film Festival. One thing about TIFF: movies that will set the fall schedule tend to roll out here. They ripped into one I've been waiting for, the remake of All The King's Men. Subscription info here. Two. Aisha Tyler guest-subbed for the ailing Roger Ebert this weekend on Ebert & Roeper, and has been my favourite celebrity substitute thus far. She's funny and articulate, howls appropriately when Richard Roeper talks, and knows movies - especially the chopsocky stuff. She's back next week. The editors of the New American Oxford Dictionary recently announced their choice for word of the year: podcasting. Podcasting wasn't actually introduced to the language in 2005, but there's no question it was used a whole lot more in the last 12 months than in the year (or years) before that. The basic point of podcasting isn't that new, either; audio files have been transferred over the Internet for years now. What is (relatively) new is the ease with which podcasting now works … and the ease with which you can get interesting material straight to your ears. Podcasting - a playful amalgam of "broadcasting" and iPod - works best when you can subscribe to a particular series, and then have the subscription do all the hard work from thereon in. So, instead of having to remember the web address of a cool radio show, for instance, and then remembering when it's updated, and then clicking on a link to trigger a download, and then waiting for a download to run its course, and then getting the sound file (usually an MP3) on a player, a subscription does it all for you. When you plug in your audio player, iPod or otherwise, your subscriptions are automatically updated for you. And what a difference it makes to actually have a player. I've been subscribing to some podcasts for months, but only got around to popping the cash for a player recently. After several audio-packed weeks, I can say this: it's much easier to listen to podcasts when you're out on foot than when you're sitting at your computer. I listen to British, American, Canadian, German and local material while walking to the store, doing chores, getting some exercise, even putting out the garbage. We're still at the early days of all this. In a year, I expect the range and quality of podcasts to be greatly superior to what's there now. Following are some of the podcasts I've subscribed to. Feel free to drop me a line about what you like to listen to. Actually, this is not a particular podcast, but a place to find them by the truckload. You'll find shows from experienced professionals, and you'll also find the most unusual kinds of audio out there. Poke around, and you'll understand why many people feel podcasting is bringing new energy into what we used to think of as radio. Jim Fidler is world-renowned for his music; he's also developing an international following for his regularly updated podcast, which comes to listeners straight from the streets of St. John's (not to mention his kitchen table, too). The tone is loose and friendly, and I think thousands of subscribers have responded to that. If I could recommend anything, it would be to edit the introductions and chatter. 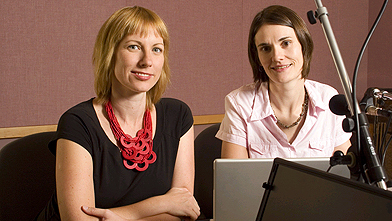 Quirks & Quarks became the first CBC Radio program to move into podcasting; there are currently three options available during a current trial. More CBC programming may be available in the future. If you would like to see more, take the survey available on the link above. Also available is a mostly-music package of alternative and independent tunes from CBC Radio 3, and highlights from the Toronto regional morning show. NPR offers a number of podcast options from this directory -- scores of them, actually. You'll find everything from political reporting to book reviews, essays on religion to tech reviews to interviews with musicians, famous and otherwise. Ricky Gervais is rightly regarded as a genius for creating The Office; he continues to make great comedy, and for a limited time is making a free podcast with cohorts Steve Merchant and Karl Pilkington. Be advised: the language gets a bit salty. That said, I laughed out loud on a walk down Water Street, as Pilkington laid out his theories on dinosaurs and pets. The Telegram's website stepped into the podcasting world last week with an interview with singer Rex Goudie. I naturally signed up for the interview; the audio quality is a bit tough, because it's a phone interview, but I imagine that Goudie fans could care less. I'm looking forward to what else the Tely folks are willing to send out. Each weekend, I have my recorder set to catch the weekly TV show featuring Roger Ebert and his sparring partner, Richard Roeper. I have to confess I haven't been bothering much to watch it, though, because I'm finding the audio version of the show - available as a podcast here - suits me about as well. Naturally, I don't get to see the film clips, but I don't think I'm missing much. Besides, catching the show while doing a morning coffee run makes me feel like I'm still in the movie loop. If you know The Simpsons well, surely you can imagine the voice of Bart and Lisa's principal, Seymour Skinner. 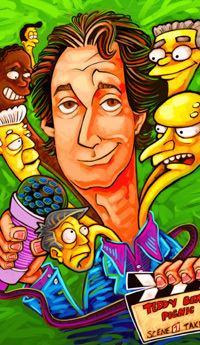 The man behind that voice (and numerous others) is actor Harry Shearer, who has been doing a Sunday morning radio show in L.A. called, well, Le Show, for many years. You can subscribe to the feed here (or listen to archived shows online). John Gushue is a news writer for CBC.ca in St. John's. E-mail: surf at thetelegram.com.